January 4th (2016) was my niece, Brooklyn's 5th birthday.​ I arrived with my 5 year old son, Jeffrey, and the evening started with a HUGE hug. Brooklyn is one of Jeffrey's favorite people and he is one of hers. Surrounded by those who love her and a pink and purple chocolate cake, with vanilla ice cream of course, we celebrated our little princess. Brooklyn is an extremely intelligent young lady. She love princesses, Barbies, ANYTHING pink, chocolate milk, M&M's and especially her dog, Lulu. Brooklyn has been such a wonderful part of my life and I couldn't ask for a better cousin for my son. 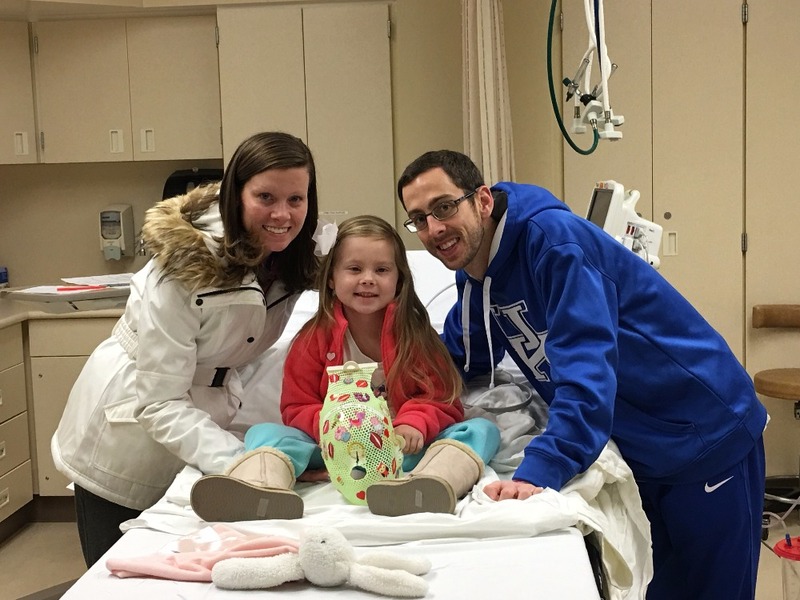 On January 11th, exactly one week after her 5th birthday, Brooklyn was admitted to Cincinnati Children's Hospital and diagnosed with Diffuse Intrinsic Pontine Glioma (DIPG). In other words, she has inoperable brain cancer. DIPG is extremely rare and for those familiar with the Lauren Hill story, it is the same kind of cancer that Lauren was diagnosed with. The outpouring of support has been overwhelming and we are blessed to have such a positive response with so many wanting to help out, so that my brother and sister-in-law can focus on what's most important - Brooklyn. All donations will go directly to Brooklyn's parents. Have you gone GOLD in September? September is Pediatric Awareness Month. It is an opportunity across the nation to bring the spotlight to all types of pediatric cancers, uniting for a single objective.... bring an end to childhood cancer. Did you know that each year, over 40,000 children are undergoing cancer treatment? Did you also know that in the past 20 years, fewer than 5 cancer medications have been approved that are specific to children? If this sounds low to you, then you join the hundreds of thousands of families, caregivers, charities and loved ones that also believe this sounds low. 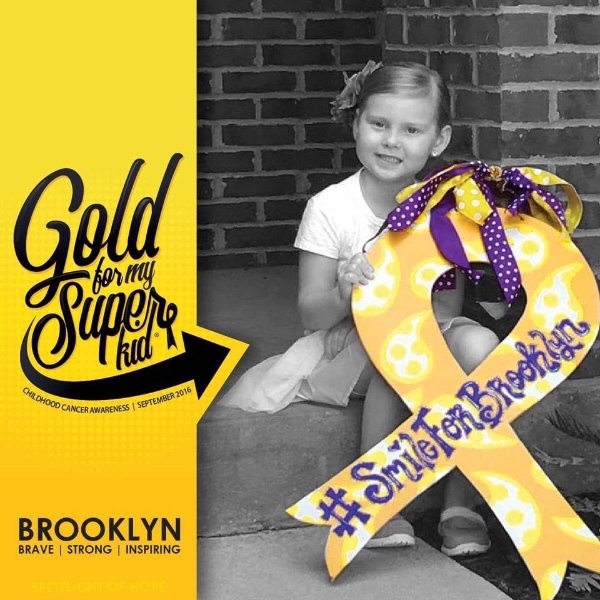 Smile for Brooklyn, Inc. has gone GOLD for September to raise awareness and funds to support DIPG research. To accomplish this, we have challenged ourselves to raise $10,000 (or more!) in September to support DIPG research. Please help us in our challenge. By donating $5, $500 or any amount, you are helping to make a difference. Research means HOPE and hope is what will drive success. September is Pediatric Cancer Awareness Month. In honor of this, Smile for Brooklyn is going GOLD for September. We challenge everyone to go GOLD with us. 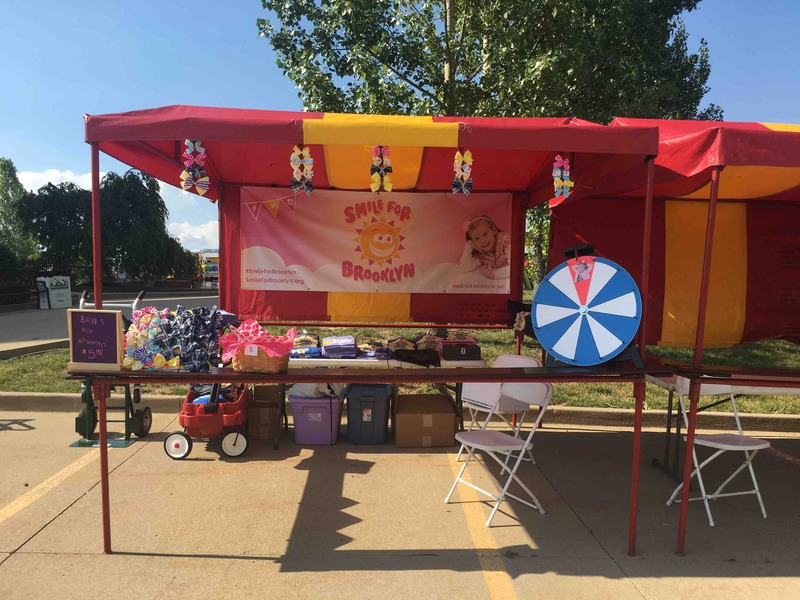 It is critical that we continue to bring awareness to DIPG and all forms of pediatric cancer. Every day, 43 children are diagnosed with a form of pediatric cancer. 88% of these children are survivors. Each year nearly 250 children are diagnosed with DIPG. To date, there are no long term survivors. The difference between 88% and 0%? Research! Everyday research is getting better to understand and combat DIPG and pediatric cancers, though there is still a long road ahead of us until we can say that there is 100% survival rate to pediatric cancer, regardless of what the diagnosis. Smile for Brooklyn, Inc knows that we can make a difference. We know that research will make the difference. Help us make the difference. Funds raised in Septmeber will help us to fund ongoing and new research on the fight against DIPG and pediatric cancer. No donation is too big or too small. Good morning, Smile for Brooklyn team! We hope you are all enjoying your holiday weekend, even though it's a little raining here in Cincinnati. 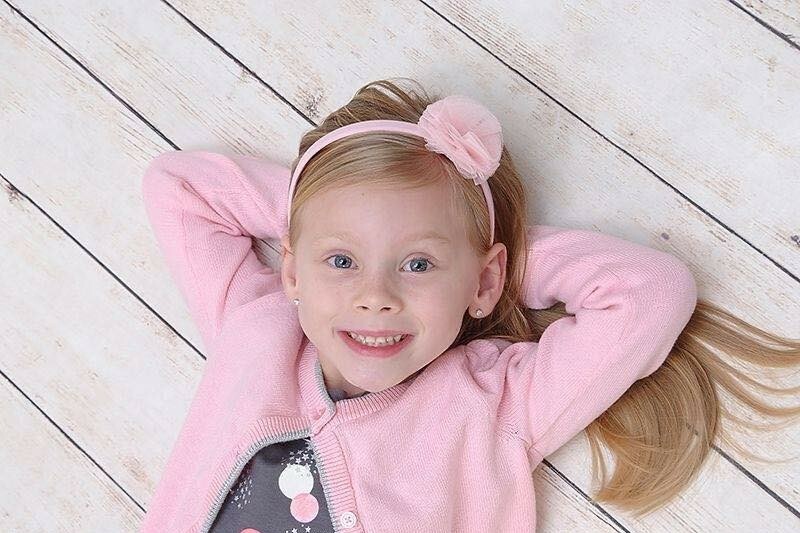 Remember, no matter what the sky may look like, Brooklyn is always our ray of Sunshine and smiling for everyone. It's important this holiday to remember what we are smiling for and to encourage others to smile as well. Our great country is what made it possible to have the best medical care possible for Brooklyn and all others fighting any illnesses. If it wasn't for all those before us fighting to make this country what it is today, we wouldn't be here or possibly able to raise money to assist those fighting illnesses such as DIPG. 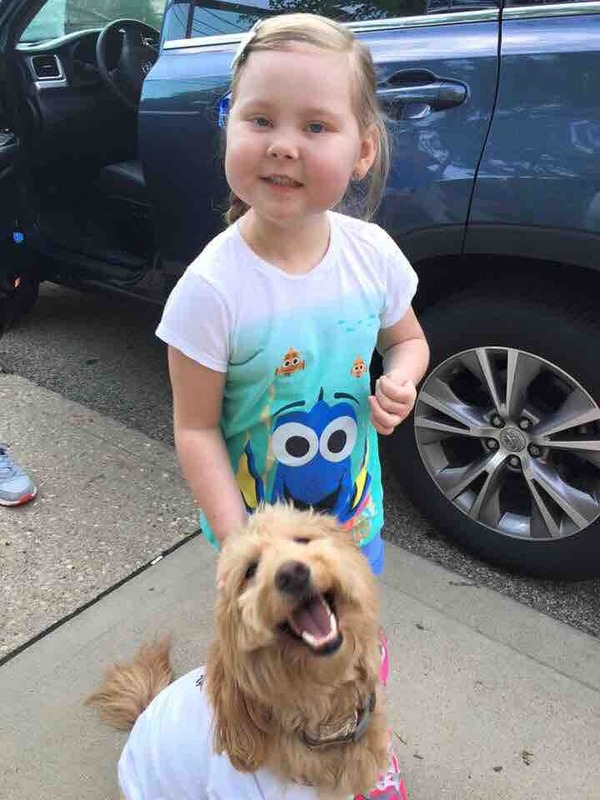 This holiday we again want to thank all those that have supported Brooklyn while on her journey to be cured and want to remind everyone that there are other DIPG families and warriors that need your support across the world. Please keep all those in your thoughts and prayers, sending smiles, and positive energy to all. Today; we smile for all of you. You all are making it possible for Brooklyn and her family to smile. You are our heroes and today Brooklyn is sending you all a very special smile! If your looking for something fun to do this weekend and enjoy the sunshine, come to PigFest in Walton KY. It is a festival held by St. Joseph Academy in Walton to raise money for their school. Smile for Brooklyn, Inc. has a booth there today and tomorrow. If you stop out tonight, you may even see our own little ray of sunshine with smiles on her face venturing around. 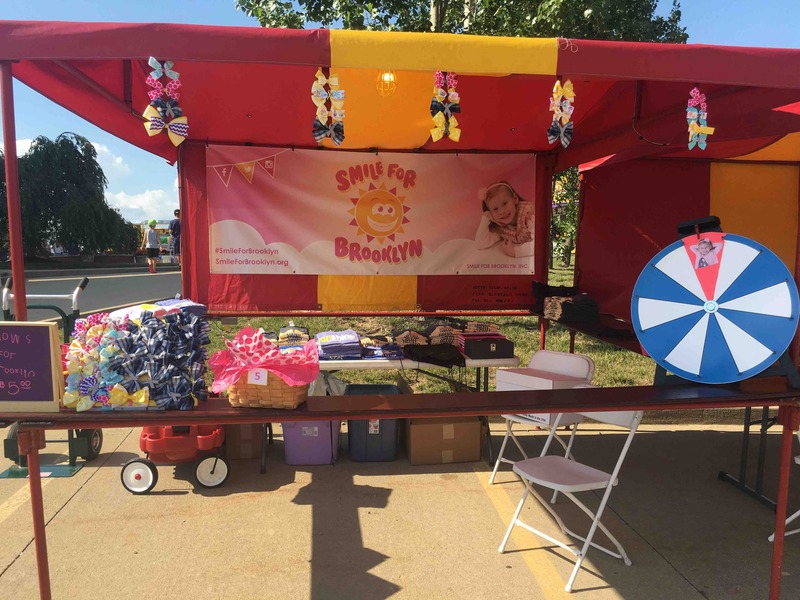 All proceeds from our booth will go to Smile for Brooklyn, Inc. check out our Facebook page (Smile for Brooklyn) for more details. Little Brooklyn is one of our students at St. Joseph Academy. I am a manager at the Cold Spring Bob Evans. We have a program where we help raise money , they are called community fundraisers. If you would be Interested in learning a little more about this and how it works. Please feel free to contact me at 859-781-4332. My name is Erin. I work Saturdays 4-10:30pm , Sunday's 9-7, off Monday Tuesday , Wednesday and Thursday 6:30 am - 4:30pm, and Friday's 3:30-10:30. Looking forward to hearing from you and I'll be keeping your beautiful little girl in my prayers. Wishing you the bedt in treatment. You are a Beautiful little girl, keep that beautiful smile. My family just dealt with brain cancer/tumor and I do not understand why this happens. Brooklyn, Brittnay, and Nick you are a beautiful family. We love you very much. Brooklyn- you have always made me smile when I've seen your pretty little face. You might be little but your light is mighty and bright. I always thought you were a special little girl. You must get it from your wonderful parents. Love you guys. Praying and here for anything you can think of nothing is too small nothing is too big. I cannot express my words and this awful thing that is attacking our children. I watch Lauren Hill suffer with this and she brought so much courage to the tri state and have.learn from her that she never gave up. She kept showing us how you can keep going and nothing will put you down. I miss Lauren very much ever though I didnt get to meet her. I pray and I have Brooklyn on our pray chain at church. I just hope she.keeps.smiling cause that what brings a smile.to.my face. Keep.smiling.Brooklyn and.never give up. Sending prayers and Love to all of you. Would love to face time you or talk on the phone when you are feeling up to it. This makes me SO sad. I live in Walton and am a member of St. Cecilia, but sometimes attend mass at All Saints. If there is anything that I can do to help, I would love to do so. They say it's rare, yet Brooklyn is the 3rd child (Lauren Hill and Kyler Bradley are the other 2) diagnosed with it in less than one year from this area. I pray that they'll find out what's causing this monster and why it's become so rampant in Greater Cincinnati/N. KY. Prayers for Brooklyn and her family. God bless them! Brooklyn and the entire Smith Family are in our thoughts and prayers. Brooklyn has been an inspiration to all of us and will always let us remember what is truly relevant in our lives. I am a Medicaid worker in Kenton county, and I have had your family on mind my from the time I met Nicholas and heard of Brooklyn's story. My/Our hearts go to you all. Prayers and success to the future cure for DIPG.